There is absolutely nothing to this outfit other than that I wanted to make a really practical yet very elegant travel ensemble for one of my female characters. I only insisted on using Walnut Brown as a dye color, because so far that color was sorely lacking in my outfits. I love the warm, dark chocolate color of this dye, and am still grateful it was added to my scholar’s crafting skills. The leggings used in this outfit are an old pair of the Burglar’s Rift armor set (now also available from the Cosmetics Vendor), that have retained their cosmetic value over the years. Combined with more up-to-date items, I still love them. Incidentally Devonna from Lotro Stylist has used those same leggings on her male hobbit, with a different pair of boots creating a very unique combination. 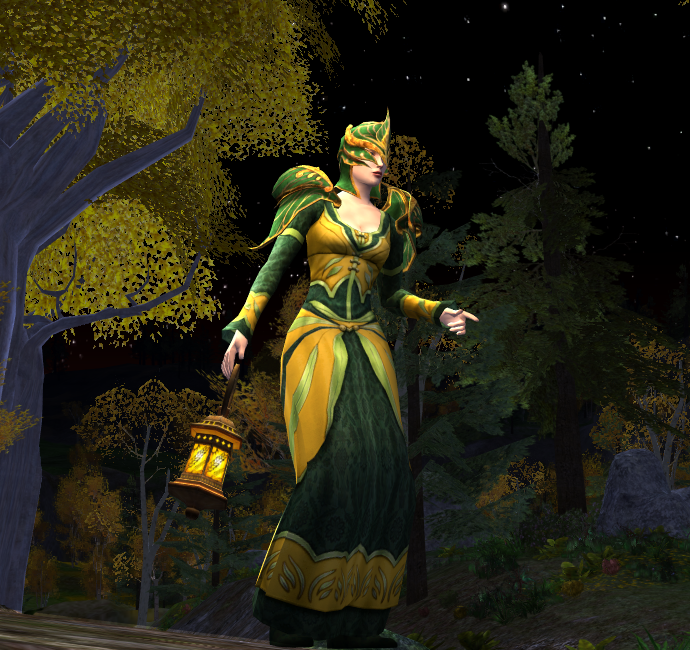 The Lotro Stylist has been actively posting some new outfits lately, so if you haven’t visited for a while, I absolutely encourage you to do so. Her outfit ideas and wonderful pictures are a “must see” for any cosmetics lover. The quiver in this outfit is a rare find these days. It used to be a craft-able tailoring recipe that would drop from boxes during the Spring Festival, but since they changed the type of boxes, this recipe is no longer on the loot list. So only few old-school tailors on the server may be able to make this quiver. Ask for it in your /world channel if you’re looking for one. Chest: Disused Robe of the Dunland Soothsayer, walnut brown dye (Dunland quest reward, or Galtrev Rohirrim Quartermaster).